The first issue of the Tipton Poetry Journal consisted of poems written by poets who had attended the Tipton Poetry Reading, which met monthly from 2002 through 2005. The readings usually featured a prominent Indiana poet, always included an open mic format, and were attended by poets from the countryside and cities around Tipton, Indiana. 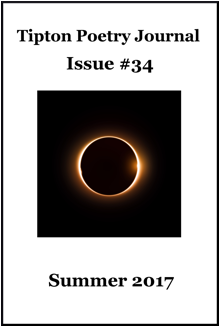 Although the monthly public format no longer exists, the Tipton Poetry Journal evolved from the energy of those public readings and is now a printed forum. The Tipton Poetry Journal, located in the heartland of the Midwest, publishes quality poetry from Indiana and around the world. TIPTON POETRY JOURNAL is published quarterly. Tipton Poetry Journal issues are in an online format at issuu.com/tiptonpoetryjournal.com followed by a print version available through amazon.com.